HOW do you say "Oh What a Feeling!" in German? Serious question. Toyota's new Supra delivers a huge dose of at-the-wheel excitement, for which Bavaria and Austria deserve some of the credit. The Supra is one of the products of a 2012 deal between Toyota and BMW to develop a pair of sports car twins. By using the same basic set of parts, this joint effort will give the German brand a replacement for its Z4, out of production since 2016 and provide the Japanese giant with a coupe to bring the Supra name back from the dead. Both will be made in a factory in Graz, Austria. Co-operation: Toyota developed the Supra in partnership with BMW. Making money making sports cars is tougher than you'd think. "It is so difficult to make a feasible business model, so we were lucky that we found a good partner," says Masayuki Kai, Supra assistant chief engineer. "Without BMW we could not revive the Supra, and this also applies vice-versa for BMW." BMW's in-line six-cylinder engines and favoured rear-wheel drive layout was what attracted Toyota. 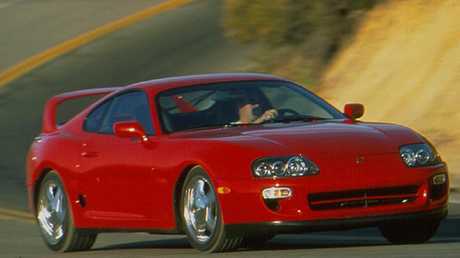 The last Supra, the 1993 to 2002 A80 model, was powered by a legendary Toyota turbocharged in-line six but the company no longer makes such engines. So the new A90 Supra must use a motor made in Munich. Engineer Kai says this was the only option. "If we had not accepted, there would be no Supra at all," he insists. "We should be happy that we could revive the Supra, even if the engine is … not a Japanese engine." The new Toyota Supra is mechanically identical to the BMW Z4. "BMW's straight six engine … very, very nice engine," Kai adds. He's right, too. But the strong, sweet-sounding and smooth-as-silk six in new Supra's snout is just one of the things that makes the Toyota a desirable drive. It also has steering, suspension and brakes to deliver everything from thrilling racetrack pace to chilling grand touring grace. There's even enough space - about 250 litres according to engineer Kai - for a useful amount of luggage. It's exactly the kind of car that a keen driver will easily fall in love with. The Supra is a quick car, both in a straight line and around a curve, but it also rides rough roads comfortably and is impressively quiet and calm on the highway. These were the key impressions taken away from a prototype drive staged in Spain, where Toyota provided dazzle camouflage-covered cars for driving on snaking rural byways north of Madrid and the Jarama racetrack on the city's outskirts. Toyota benefits from BMW excellent inline six-cylinder engine. Supra production doesn't begin until the first quarter of next year and it is scheduled to go on sale in Australia sometime in the second half of 2019. But Toyota wants to get the word out that Supra is on the way back … and worth waiting for. The car will be the first road car to wear GR (for Gazoo Racing) branding. 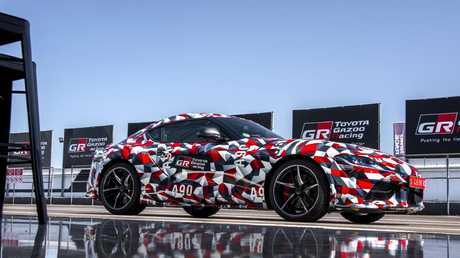 This Toyota sub-brand is tasked with co-ordinating all kinds of racing, where the Gazoo Racing name is already well known, plus creating road cars like the new Supra. The objective is to make GR to Toyota what AMG and M are to Mercedes-Benz and BMW. The Spanish event was all about oh-what-a-feelings, not figures. Toyota chose to keep secret facts like engine power, acceleration times and fuel consumption, despite the fact that on the same day we drove the car, BMW released detailed information about its Z4. Toyota has not revealed any official performance figures for its new Supra. 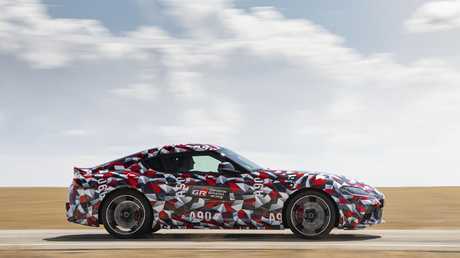 For reference - the numbers are unlikely to be identical - BMW says the Supra's German twin has a single turbo inline six that will put out 250kW and 500Nm, propelling the convertible to 100km/h in 4.6 seconds. 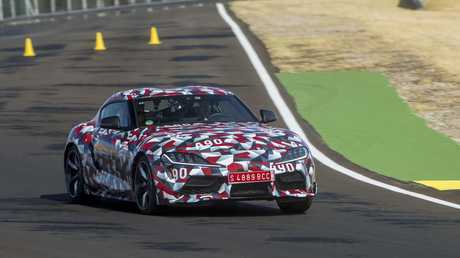 Toyota has since provided rough performance figures stating that the Supra will produce more than 220kW and 450Nm and be able to sprint to 100km/h in well under five seconds. 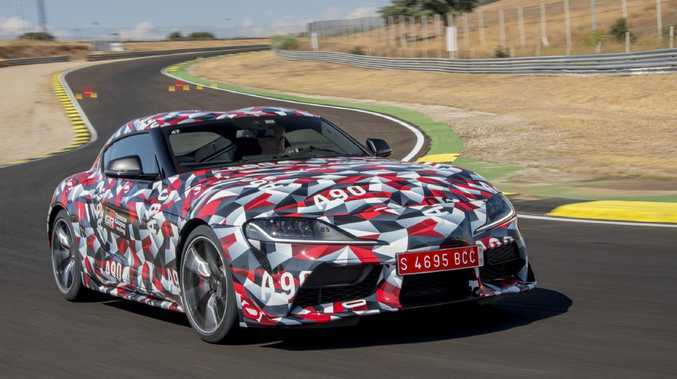 Under cross examination, Toyota engineers confirmed that the Supra's six is a single-turbo 3.0-litre, paired to a standard eight-speed automatic from German company ZF. BMW will also have two four-cylinder turbo models, but it is unsure whether Toyota will follow suit. 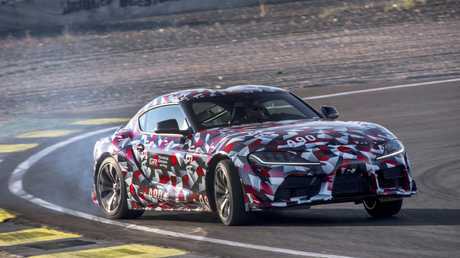 Toyota's engineers claim the Supra's body structure is as stiff as the carbon fibre Lexus LF-A supercar of 2010, that its centre of gravity is lower than the current GT86 sports car, and that its front:rear weight distribution is a BMW-like 50:50. Further, with the car's Australian launch at least six months distant, no-one from Toyota would discuss pricing in detail. "Of course it will be below Porsche (Cayman)," says engineer Kai, adding that pricing will be based on the Supra's competitor set. So expect something in the $75,000 to $100,000 bracket. The Spanish Supras were equipped with adaptive shock absorbers and a computer-controlled active differential. These might be standard equipment when the car reaches showrooms, or they may be options. And these won't be the only hardware choices that have to be made before launch. Toyota Australia execs wouldn't hint which way they're thinking of jumping, but whatever they do will influence pricing. What is a sure bet is that the Supra model family will grow. Kai confirms more powerful engines are being developed and that a manual transmission may be made available if there's enough demand around the world. And although the Supra will launch as a coupe and the Z4 arrives as a convertible, Kai says there's nothing in the agreement with BMW to stop Toyota also doing an open-top model. The Supra is rear-wheel drive only. The Japanese engineer has worked in Munich on Project Supra since 2012. Kai spent some of his childhood in Germany, and his ability to speak the language made him an obvious choice to handle a liaison role. At first the BMW and Toyota crews worked closely, Kai remembers. 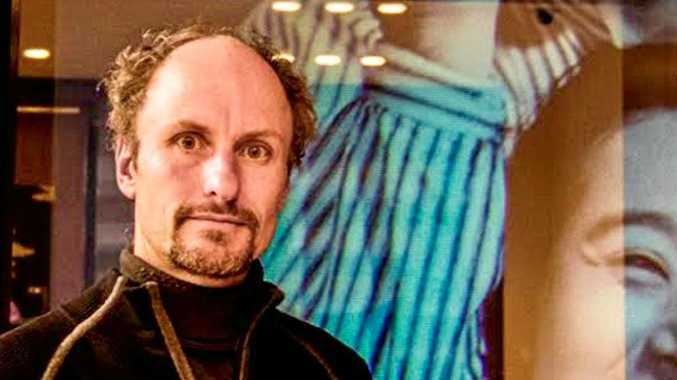 "What we decided jointly was packaging," he says, "like where does the driver sit, where is the fuel tank, where is the engine and where is the A pillar, for example." Once the basics had been jointly finalised, things changed. "Until that time we were always discussing together and aligning together, but from that point on we completely separated and we did not have any exchanges." Toyota sent a team of eight or nine designers to work for two years in Munich on shaping Supra inside and out. The exterior is totally Toyota, but the interior team had to work around components that were too expensive to change. Stuff like BMW's distinctive centre screen and switchgear, for example. But the Supra at least has a Toyota-designed instrument cluster to set it apart. The Supra interior features a lot of BMW parts. Some will find the idea of a Toyota-BMW collaboration hard to swallow. Diehard Supra enthusiasts may sneer at the new model and delight in calling attention to visible signs of its mixed heritage. But although the new Supra is no purebred, driving pleasure is what it delivers. And that's what really makes or breaks a sports coupe, no matter what badge it wears. Unlike its ancestors, the new Supra is a two-seater. Every one of the four previous generations, all the way from 1978 to 2002, featured a 2+2 interior. There are two reasons for the change. 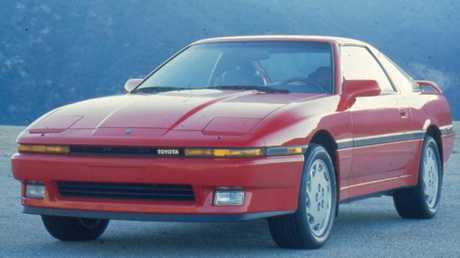 First, Supra chief engineer Tetsuya Tada wanted a compact footprint for excellent agility, so the distance between the car's front and rear axles is shorter than all the old models. Second, Toyota already makes a sporty 2+2 coupe, the GT86. 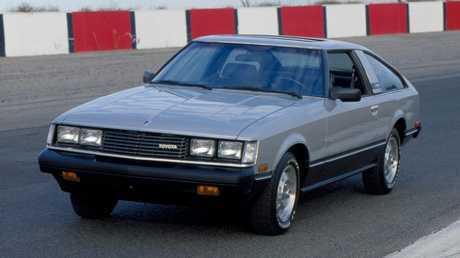 1981 Toyota Supra Celica A40. A40 1978-81 - Long-nose version of the Celica with a 2.8-litre straight six. 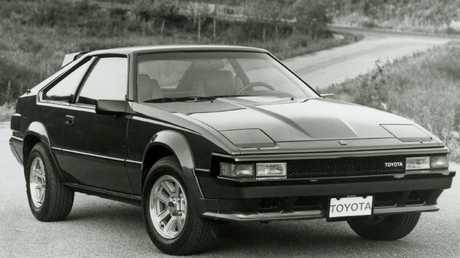 A60 1981-86 - Edgy, wedgy, still a Celica variant. 2.0- and 2.8-litre in-line sixes. A70 1986-93 - Now simply Supra, with added power. Turbo 3.0-litre topped line-up including smaller non-turbo sixes. A80 1993-02 - Legendary twin-turbo 2JZ-GTE 3.0-litre six never officially imported, but was a grey-import favourite.